"Two years ago I was serving God in Mexico. I never thought I would have the privilege of being a student at Capital Seminary. Thanks to the Scholarship Fund, studying God's Word is possible." 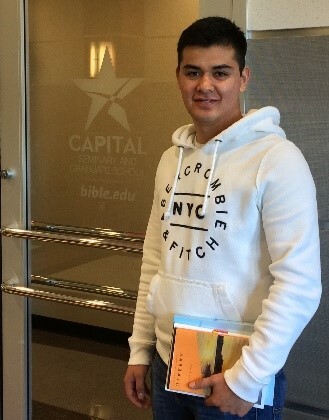 Your generosity provides scholarships that keep our talented students, like Rodrigo, at LBC | Capital. 70% of our students rely on scholarships to attend school. Our hearts break when a student leaves due to financial challenges. Your giving strengthens our students and strengthens God's Kingdom. We thank you for understanding the vital importance of equipping our students to think and live a biblical worldview and to proclaim Christ in the Church and society. For more information, please contact Dr. Michael Black at 717.569.7071 ext. 5801 or mblack@lbc.edu. Invest in the lives of our students today! Nearly three out of four students receive scholarship aid at LBC. 1,397 students were funded in the 2017-18 academic year. The Scholarship Fund was established in 1987. The average Pennsylvanian college graduate has $35,185 in student debt. The average LBC graduate has $30,511.